We at Control Solutions Minnesota had been promising graphical programming (or visual control programming) for a while. But we had a hard time finding a tool set that was easy to use, worked well, was simple to install, required little or no maintenance, and was powerful and flexible. We also wanted one more thing: Very inexpensive. We found a number of expensive programming tools. We also found inexpensive drawing tools that had no means of translating a drawing into code. We found lots of fun graphic toys that made very pretty pictures with no resulting functionality. But after a long search, we finally found an open source CAD package that we converted from drawing electronic circuits to drawing programs. Instead of generating a net list for circuit board layout, our version generates code for downloading into a controller. The resulting tool met most of our objectives for graphical programming, and exceeded the rest. We call our new tool i.CanDrawIt®. We know from experience and customer feedback that the majority of our customers are more comfortable with an electrical schematic than a program source listing. Therefore it was important to us that our graphical programming tool most closely resemble a schematic CAD package rather than something you would find in the IT department. 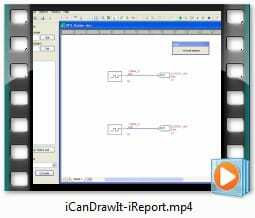 Once we started working with i.CanDrawIt®, even our most experienced software developers quickly found a preference for drawing control diagrams rather than writing control programs just because it saved so much time. i.CanDrawIt® allows you to quickly create logic. But i.CanDrawIt® also includes PID loops. Both single output and dual output PID function blocks are included in the standard control library. Loop output can be analog, such as 4-20mA loop. Time proportioning function blocks are also available for running discrete outputs in time proportional mode. For more information about PID loops, visit the applications page dedicated to PID loops. i.CanDrawIt® is only limited by your imagination and your skills. You can create other complex functions if you have some programming skills. The most typical scenario is that your controls engineer will create new function blocks and write the underlying code, while field technicians will simply drop that block onto the drawing and connect it. When you have questions that are not covered in online help, just open a Support Ticket (under Support menu above) and we will be happy to try to figure things out for you. i.CanDrawIt® works just like an electrical schematic CAD program, except you draw control programs that look like circuits. The resulting software will function like the circuit you draw. i.CanDrawIt® includes visual program simulation as well as visual live debugging where supported by the target device. Set breakpoints or step through the program one visual function block at a time. Update variables and I/O objects in simulation or live. i.CanDrawIt® is included at no additional cost with every ­ValuPoint® controller, every i.CanDoIt® server, and every ­AddMe® network I/O node from Control Solutions Minnesota. Use free form logic style, ladder logic style, or hybrid mix of styles. Fully customizeable and expandable function block library with source code is included. The i.CanDrawIt package includes offline simulation as well as live debug with certain hardware models. Single step one function block at a time, or set breakpoints to suspend program operation when it reaches a certain function block. When the breakpoint is reached, that function block is highlighted, and you have the opportunity to inspect (and optionally change) program variables. The graphical programming tool also lets you create new function blocks of your own, and add code to define what they do when placed on a drawing. Don't let this code stuff scare you off. You can build some very complex control systems with the function blocks already in the library. We just want you to know you are not limited to pre-defined function blocks - you can be creative if you like! 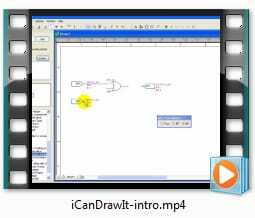 Watch these videos for an introduction to graphical programming. It's easier than reading! The i.CanDrawIt for AddMe III and AddMe Jr is generic, and will generate code that will run on any Control Solutions product supporting the PL/i runtime environment. Programs created for the AddMe servers are uploaded via the web interface or via FTP using their Internet connection. There are model-specific versions of i.CanDrawIt for ValuPoint programmable I/O, and i.Report remote monitoring devices. Although download links are provided here for these versions, the software is also included in the full support package for these models. You should download and install the complete support package for ValuPoint and i.Report since live debug relies on the physical connection between the configuration tool and the actual hardware. The only difference in the model-specific version is support for live debug that varies by model.